For an everyday outfit that is full of character and personality go for grey wool dress and toddler girls truly me polka dot leggings from Nordstrom for your child. Black ballet flats are a wonderful choice to round off this style. Suggest that your darling wear blue denim dress and toddler girls truly me polka dot leggings for a trendy and easy going look. Silver sandals are a nice choice to complete this ensemble. 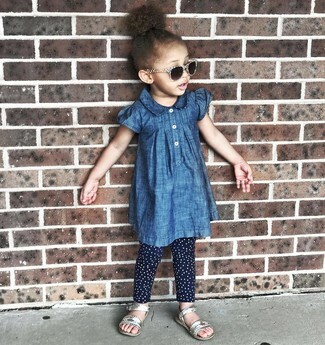 Suggest that your little one choose navy denim dress and toddler girls truly me polka dot leggings for a cool, fashionable look. As far as footwear is concerned, let your darling throw in a pair of green sneakers.